It has been a rough start to the season for the Pittsburgh Penguins in terms of injuries. It started in the offseason with Tomas Vokoun and a serious blood clot and has continued with broken bones and significant muscle strains/sprains ever since. Here is an update on some of your favorite injured Penguins and when/if I think you should expect to see them again this season. Background: The Penguins received their first bit of bad news on the injury front on September 21 when Tomas Vokoun had a procedure to dissolve a blood clot in his pelvis. It was a scary situation that had the initial diagnosis for him to be out 3-6 months. It was not Vokoun's first time dealing with blood clots. He was unable to finish the 2005-06 season with the Predators after being diagnosed with pelvic thrombophlebitis, a rare blood condition that creates a multitude of blood clots. He was cleared to play to start the following season and has been OK until this recurrence. Make no mistake about it, this is a disease that Vokoun will live with forever, and it is one that can be life-threatening. Vokoun was an integral part to the Penguins' success last year and while Jeff Zatkoff has played better as of late, the organization would love to have Vokoun back to help in the playoffs. The only thing that is clear is that so far Vokoun's recovery is going well. He meets every two weeks with doctors to have blood drawn. Assuming things keep going well, Vokoun would be worked back into the mix very slowly to see how he responds. In this particular case, I think he will be out closer to six months than three months. I would not be shocked if he ended up choosing retirement in the end, but it would be a huge boost for the Penguins to have a competent and trustworthy backup for Fleury. Background: After a fairly abysmal defensive effort in last year's playoffs, Ray Shero knew a change was needed. He brought in Jacques Martin for a coach, and then turned the clock back by signing fan favorite Rob Scuderi. Dubbed "the piece", Scuderi was an integral part of the Penguins 2009 cup run, and is known for his stay-at-home defense. Scuderi broke his ankle on October 26 against the Maple Leafs. After having surgery a few days later, the Penguins announced he would be out 8-10 weeks. Update: Not a whole lot has been mentioned about Scuderi recently. However, at 8-10 weeks, his return should be somewhere around Christmas. With a broken ankle that requires surgery, the player needs to pretty much stay off of the leg for 6-8 weeks to let the bone heal completely. After that, the issue of conditioning remains. I think we'll see Scuderi back in the lineup by January 1 at the latest. Background: Paul Martin's time as a Penguin has been a bit of a roller coaster. After he had a terrible first year with many fans wanting to run him out of town, he had quite a rebound season in 2011-12 and has not looked back ever since. It can even be argued that he has been the Penguins most consistent defenseman. Prior to his injury, Martin overtook Kris Letang as quarterback on the first power play unit. He broke his leg in the contest with the Boston Bruins on Monday, November 25, and Coach Dan Bylsma announced Martin would be sidelined for 4-6 weeks. Update: The good news for Penguins fans is that Paul Martin had a stable fracture that did not require surgery. This decreases the healing time significantly. When you compare Martin's fractured tibia to Stamkos' open and displaced fracture, the healing time varies by almost four months. At four weeks, Martin could return around Christmas (sensing a theme here?). As with Scuderi, Martin will need a bit of time to regain his conditioning, and I believe we will see Paul Martin back on the ice around the new year as well. Background: Just as Beau Bennett was finding his way as a top-six forward alongside Sidney Crosby, he suffered a significant wrist/hand injury that will sideline him for 8-10 weeks. For a team with not very much scoring depth, Bennett is an important piece to this team and their ultimate success this season. The reason this injury is more noteworthy is because Bennett has a history with wrist injuries. In college he fell on a player's skate and lacerated his wrist tendon, an injury that will never fully heal and something Bennett has to play through. Update: There is good news and bad news about this injury. Because his injury is with his hand/wrist, he will be able to maintain cardio exercise and conditioning throughout his recovery. The bad news is that this is a huge injury due to Bennett's past history. At 8-10 weeks, Bennett could theoretically return at the end of January, but I suspect it could be much longer. With how much wrist muscles are used for passing and shooting, it will take a few more weeks for Bennett to regain his strength, and even longer to feel comfortable. Penguins fans will hopefully see Bennett back sometime in February and hold their collective breath to see what kind of shape his shot is in at that time. Background: Tanner Glass is in the final year of his contract with the Pittsburgh Penguins. After a disappointing year last year, Glass turned his game around this year. He has been contributing on the penalty kill, the score sheet, and with his grit and toughness. He is another important piece to the Penguins' puzzle because this team is largely considered to be one of the softest Penguins teams in the past five years. After blocking consecutive shots by P.K. Subban in the November 23 contest in Montreal, Bylsma announced that Glass will be out 3-4 weeks with a broken hand. Update: While it is hard to guess where Glass fractured his hand, the fact that he can return in 3-4 weeks means his fracture was probably stable as well. The photo shows that the biggest difference between Glass' injury and Bennett's injury is the location. 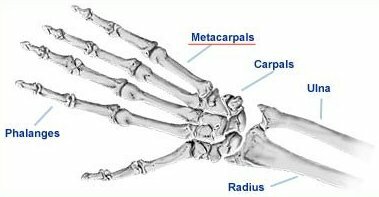 Bennett's is further down the hand into the wrist area, and as you can see from the photo above, those injuries are more complicated due to so many small bones in a small area. At four weeks, Glass should also be back for Christmas. A quick update on Chuck Kobasew -- He returned to practice last Thursday and I would think he will be back in the lineup this week against the Islanders or the Sharks. I hope this list helps sort through all of the Penguins injuries. Aside from Beau Bennett and Tomas Vokoun, we can all look forward to the new year because the Penguins should be healthy (fingers crossed) by then. It is easy to see why some fans are hesitant to write Dan Bylsma and this team off so quickly. Aside from the list above, the Penguins have missed James Neal and Kris Letang for an extended period of time this year as well. When this team is healthy, they will be a contender not only in the Eastern Conference, but for the Stanley Cup as well. In the mean time, if they can keep their winning percentage around 64%, one of the highest in the NHL, they will have the luxury of not trying to rush any of their stars or role players back into the lineup.